Final Presentation Day has Arrived: Catching Up with The Kiski School’s Inaugural Class of Inventionland Institute Students! The first educational institution to incorporate our innovative Inventionland Institute coursework into their curriculum was none other than Inventionland founder and CEO George Davison’s alma mater, The Kiski School in Saltsburg, Pennsylvania. As the story goes, after Davison presented the course, which focuses on S.T.E.A.M (Science, Technology, Engineering, Art and Math) education, to The Kiski School seniors last fall, they scrambled to sign up for class. To get their creative juices flowing, they visited Inventionland, where they enjoyed a tour of the creative design facility that turns out hundreds of new product prototypes monthly. Following their Inventionland tour, Executive Director of Design Nathan Field gave the students a booster talk on what to expect throughout the inventing course. “I’m kind of smiling right now… They were definitely enthusiastic to get started,” said Field. 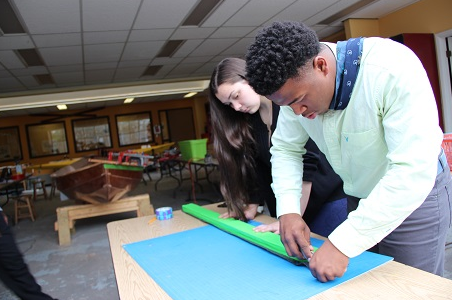 Just a few months into the course, it was Field’s turn to visit The Kiski School campus to check in on the Inventionland Institute students’ progress. Like so frequently happens during the inventing process, Field said the students were working diligently on various parts of their projects. 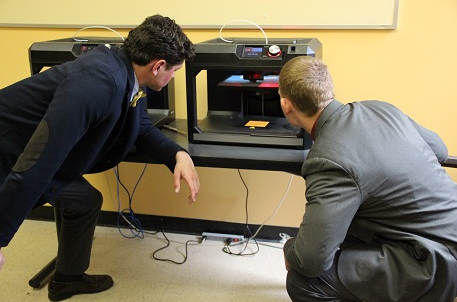 During Field’s Kiski visit, the students also got a jump start on the final part of their Inventionland Institute course when they gave mock product presentations. By design, the Inventionland Institute course culminates with students trekking back to Inventionland to pitch their new product ideas to an expert panel for review. For The Kiski School’s inaugural class of Inventionland Institute students, that course culmination is happening at Pittsburgh’s Inventionland today! See how this inaugural class of Inventionland Institute students has put their full set of S.T.E.A.M skills into creating innovative new products. Check back soon for an entire recap of The Kiski School’s final Inventionland Institute presentations.